A stair lift for disabled people is ideal for anyone having difficulty with stairs due to an accident, illness or age, and Indy Lifts offers a wide variety of stair lifts that make life so much easier for anyone experiencing difficulty climbing stairs. Indy Lifts offers stair lifts for disabled people with a variety of features such as adjustable seat height, folding steps, seatbelts soft start and soft stop. We offer a large selection of high-quality and affordable stair lifts backed by a comprehensive warranty with 24/7 on-call support, including narrow, custom, extra large, outdoor and wheelchair platform stair lifts that are ideal for your home. We also have models for all types of stairs, from narrow stairways that are common in older homes to curved staircases and porch stairs. 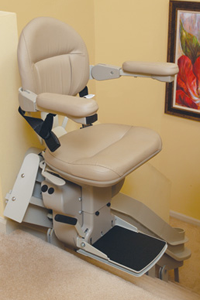 We offer stair lifts for disabled people that are customized to the architecture of your home. Our stair lifts for straight staircases feature rails that are cut to match the length of your staircase and can be configured to run along the left or right side of the steps. Curved stair lifts feature custom built rails to match the contour of the staircase and can also curve around a banister. Our trained technicians can install curved stair lifts with the professional expertise required to accommodate the stair case in your home. Our most popular stair lift model is the Indy Pinnacle which is only 11″ wide, the narrowest stair lift available. It features safety sensors to stop the lift when it meets an obstruction with indicator lights that provide an easy operating system. It has an adjustable seat for height and swivels at the upper landing for a safe and simple exit and entry. It holds up to 350 lbs. with a speed of 17-21 feet per minute. Contact us toll free at 888-203-5754 for more information about the Indy Pinnacle and stair lift and other convenient models. Indy Lifts has the stair lift that makes life easier for elderly or disabled individuals who can enjoy their homes with greater mobility with a professionally installed and serviced stair lift from the industry leader.